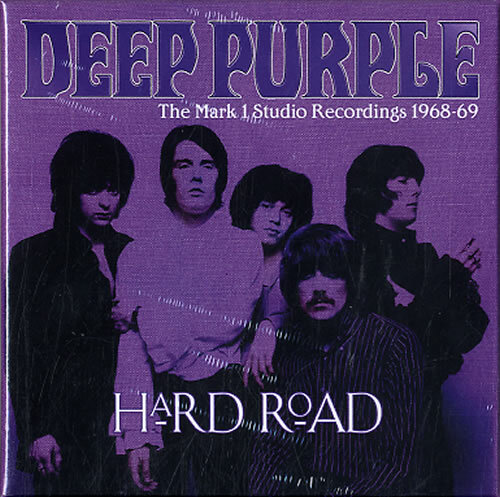 DEEP PURPLE Hard Road: The Mark 1 Studio Recordings 1968-69 (2014 UK 5-CD album box set comprising the albums - Shades Of Deep Purple [Mono Mix], Shades Of Deep Purple [Stereo Mix], The Book Of Taliesyn [Mono Mix], The Book Of Taliesyn [StereoMix] and Deep Purple [Original Album]. Each album includes digitally remastered bonus material including alternative mixes, album outtakes, instrumental versions, alternate takes and B-sides as well as previously unreleased versions - featuring a total of 19 bonus tracks. Each album comes in a card picture sleeve with a 48-page booklet and all housed in a clamshell picture box - still sealed DPMK16869).